As of this morning, I have completed part 2 (I think that’s up to chapter 19). Well, in a moment of weakness after work Thursday, I popped into the local Barnes & Noble and shelled out the “big bucks” for a nook. I purchased and downloaded the newest Stephen King book (Under the Dome) as my innaugural read via this method. I’m about 110 pages in (out of 800+) and, as a simple, portable reader I have no complaints. I am pretty disappointed in a couple other functions that I had high hopes for (and this may admittedly be partly because I just started using it and am not that savvy a user yet). The dictionary: I was surprised when I highlighted the word “trundled” (yes, I already knew the meaning) and it said ‘not found’. Now, would it have found just ‘trundle?’ I don’t know. And I don’t know yet if I can look up a variant of a word; all I know how to do is highlight a word on the page and look that up. Highlighting and notes: this has the same problem as navigating to look up a word. I am inveterate ‘underliner and note-taker’ when reading, so this may also be a major disappointment as well. Maybe future upgrades will help my issues. I hope. Any other nook owners out there that can help ease my pain? This will be my fourth book in Project: Civil War. It is a dauntingly long novel, with which I’m sure everyone is familiar. It won the Pulitzer Prize in 1937 and, of course, was made into one of the most famous movies of all time. Now, frankly, I don’t give a damn (sorry, that was too easy) about movies per se and I am one of the probably few people who has never seen Gone With the Wind. I have seen bits and pieces here and there, and have always meant to watch it, but never got around to it (or never had the four hours in a row to spare). As of this morning’s one-hour reading session while sipping my Starbucks (Grande Decaf with Hazelnut syrup with no room for cream), I am about 175 pages into the book (my version anyway), which finds Scarlett living in Atlanta, with her sister in law and ‘aunt-in-law’. Those poor unfortunates assume Scarlett’s depression is due to her dead husband, and not the fact that she has to follow society’s conventions regarding mourning and is not “having any fun.” Scarlett sees a chance at getting out, though, to help fill in with preparations for some party, and that is where I left her this morning. I am enjoying the book so far. Not surprisingly, I always make an effort to check out this section of our sunday paper, which usually includes a few reviews of new releases, and the top ten bestseller lists in fiction and non-fiction. They also have a feature where a reader writes them telling who they are and what they are currently reading, with a couple paragraphs on why they like it, etc. I’ve often noted that those readers featured are almost always listed as “retired” under profession, and have thought about writing in myself to break the monotony. This past sunday, however, the featured hoosier reader was nine year old fourth grader who has the goal to read all 89 John Newbery Medal winners. Very ambitious for one so young. She also has her own blog chronicling her efforts, which I would like to take a moment to applaud. Nice going Laura! I re-read this book because it was discussed last night by the “Shared Pages” bookclub (held at “Bookmama’s” bookstore in Irvington); it is a short book and appears on many “top novels” lists. As doubtless many already know it is set in a future where books are illegal and fireman do not put out fires (houses in this future are fireproofed), but instead start fires to burn books (451 degrees is the temperature that paper is said to combust, but I think that’s 451 celsius, and I read “Fahrenheit 451” just ‘sounded better’ to Bradbury). Guy Montag, the protagonist, is a fireman who begins to question things after meeting a new neighbor, a young girl (Clarisse) who has somehow thus far avoided being ‘numbed’ by the dystopian society. 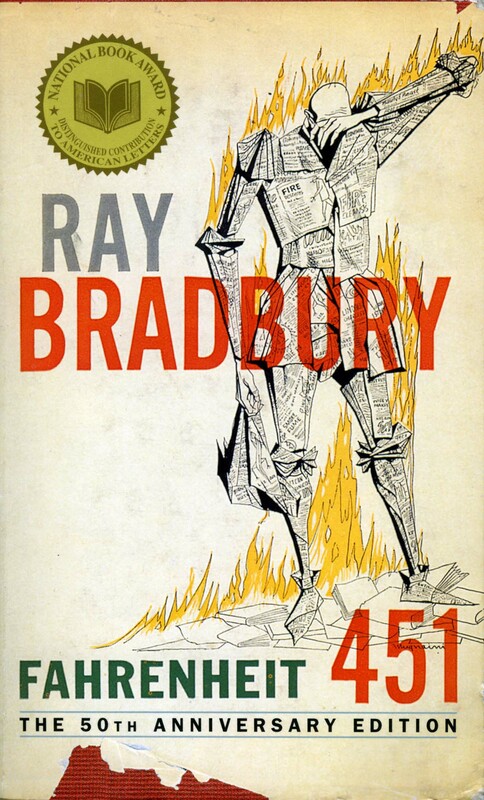 There are many ‘futuristic’ things in the story that were correctly anticipated by Bradbury, including ear bud speakers (they are ‘shells’ in the story), and big screen tvs, and assassination drones (like the unmanned many aircraft being used in Afghanistan & elsewhere now) are not all that different from the terrifying Mechanical Dogs in the story. I last read this book in 2001. It was also made into a movie in the 60s. A remake of the movie was investigated by Mel Gibson, but plans eventually fell through, partly because – with the advent of computers – it was thought it would not be as powerful in today’s society. It only took four days to get through this book. I think I enjoyed it just as much the second time around. I had forgotten about his interlude in the ‘deep south’ and the distasteful encounters with racism found there. He also spends a little too much time on Texas. 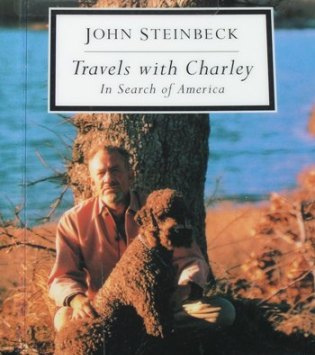 I particularly liked the passages where he discussed the intelligence of Charley (that’s his dog – in case you didn’t know); I think we’ve all known dogs that share some of his characteristics. I also liked his comments on the great redwood trees, even saying how no portrait or picture can adequately convey the sense one gets when standing next to one. This reminded me that recently – I think it was in National Geographic – there was a big deal about a fold-out picture of one of the Sequoia trees and how it was photographed in using a camera that panned down the entire length of one. I just did a quick search and here is a link to where one could purchase that photo, or browse through some others. This will be my second time around for this book. It was picked by someone in my book club to be our book for March of this year. Since I already finished our February book, I thought I’d go ahead and refresh my memory on this one. After one day I’m already about 40% through with it. A great read. Steinbeck is a quality writer, and I can really tell the difference compared to some of the other stuff I’ve read lately. I’d have to say that one of the things I enjoyed about this book is Watkins’s ‘humbleness’ in his writing. He knows there are some things that cannot be explained or described (and I don’t just mean by HIM, but more so by any writer, although he graciously speculates otherwise). One particular passage struck me. We are all, I’m sure, familiar with the phenomenon of – upon learning a new word – “suddenly” seeing that word in print the next day or soon thereafter. Perhaps the same may be said of learning of or reading new books. As I have posted about earlier, I have been reading some Sir Walter Scott lately, having completed the novel, Waverley and having started the novel, Guy Mannering. Well, lo and behold, as I’m reading Company Aytch last night, I come upon a sketch about one soldier, a certain Sergeant A.S. Horsley, whose knapsack is inspected by General Bragg’s inspector general, General Owleydousky. The contents? It included Ivanhoe, Guy Mannering(! ), Rob Roy (all by Scott) and various other books. It seems he ‘carried the literature for the regiment’. I speculated earlier about my potentially being the ‘only person on the planet’ currently reading Guy Mannering. And yet here in reading this book, looking back nearly 150 years, a poor soldier is tromping through the Civil War in Tennessee carrying this very same book. Very cool. Just finished Company Aytch by Samuel Watkins this morning. 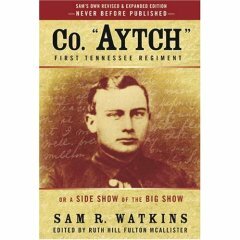 It is a memoir of the civil war by a private in the Army of Tennessee. Total of 240 pages and fairly fast and compelling reading. It is more a series of short two or three page sketches about various battles, incidents and people. Watkins is “a good writer for just a Private” – that sounds bad, but I guess one expects the ‘rank and file’ of the army to not be as educated or literarily (is that a word?) adept. The book was written over 20 years after the end of the war, and Watkins continually inserts the disclaimer that he’s “just a private soldier” and to “consult the histories” for more information. He also has a habit of describing half the people in the book as “the best soldier ever to shoulder a rifle” or “the best soldier ever to tear a cartridge”, etc., etc. Many of the descriptions in the book are not for the faint-hearted though, as war is, indeed, hell (I believe that quotation belongs to Sherman). If you want to sample this book, it is available in the public domain. Here is a link to the book on Google Books.